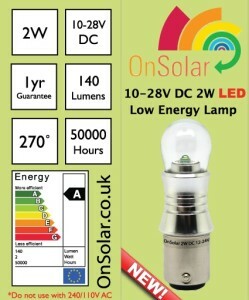 Our customers are singing the praises of OnSolar Low Energy 12V and 24V DC Lighting! We have gone to quite some lengths to produce a good value, power economical product which can be used to provide quality illumination for domestic, indoor and outdoor projects as well farming and remote applications to provide safety oriented illumination. 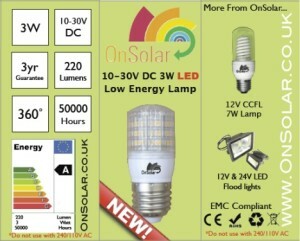 OnSolar is proud to state that virtually all of our thousands of customers are so satisfied that they not only go on to purchase further lamps but also recommend us to their friends and associates – we salute you and thank you from the bottom of our hearts for choosing www.OnSolar.co.uk Low Energy 12V and 24V DC Lighting. If minimal power consumption is the order of the day, look no further. Our brand new 2 Watt BA15D / SBC is a real star! Producing up to 140 lumen of lighting power, makes an ideal replacement for 15 and 20w incandescent bulbs. Our delightful 3W LED is already proving popular for many low voltage lighting projects including home and boating, off grid and business users!